With a smooth and glossy finish, Dr. Martens present the Adrian Tassel Loafer. Conforming to Dr. Martens' high standards, the loafers boast a superior leather construction and hard wearing sole for maximum slip resistance. Classic in shape, the loafers flaunt a tasselled decorative bar with fringed front, apron toe and contrasting welt. 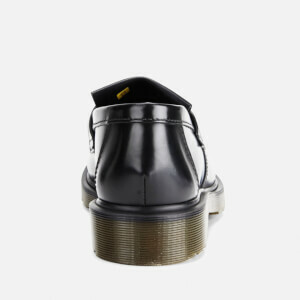 Finished with signature Dr. Martens air-cushioned sole for comfort. Treat with a suitable leather protector and avoid contact with liquids. - K.N. Treat with a suitable leather protector and avoid contact with liquids.